Leaving a newly released tooth out for the tooth fairy has always been a little fraught with danger for my children. A cup left on the kitchen window sill has ended with many a tooth down the drain and we’ve lost a couple in bed when they’ve been placed under a pillow. So the Turtle Tooth Fairy Box may be just what’s needed to avoid more such shambles. The cute turtle is made from birch wood and hand-painted in beautiful purple or blue. A leather hinge lifts the shell, revealing a soft felt pad in anticipation for a sweet tooth fairy exchange. 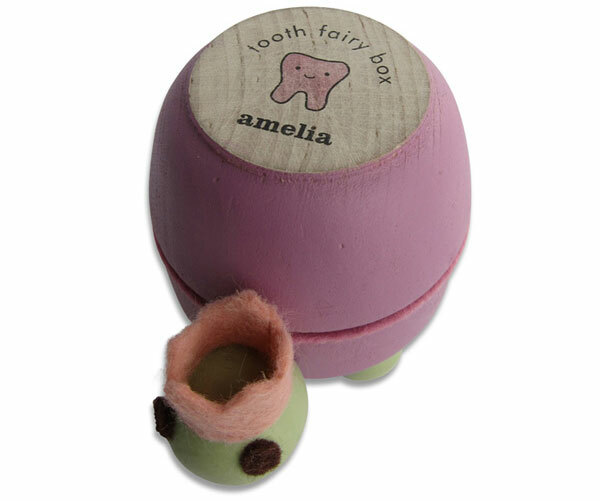 The Turtle Tooth Fairy Box makes a unique gift that can be made even more special by choosing to personalise it with the recipient’s name – handy if your tooth fairy loses track of who’s tooth she’s dealing with. Turtle Tooth Fairy Box is available for US$34 from Tree by Kerri Lee and personalisation is an extra US$6. Unfortunately there is no shipping to Australia so it might be time to call in that favour from friends residing in the US.